Reed Exhibitions, organiser of Global Gaming Exhibition (G2E) Asia, and O MEDIA, publisher of Inside Asian Gaming, have announced they will partner to produce a new daily newspaper, G2E Asia Daily, at G2E Asia Expo this year. Celebrating the 11th anniversary of Macau’s biggest gaming industry exhibition and conference, G2E Asia Daily will be printed and distributed on the morning of each of the three show days on May 16, 17 and 18. 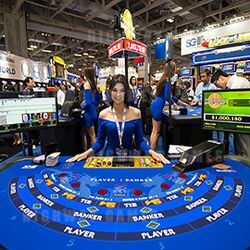 It will provide the latest news from the conference and exhibition floor, showcase exhibitor products and provide information on everything from G2E Asia press conferences and media launches to various networking events. G2E Asia Daily will be displayed and distributed at the show entrance, personally delivered to every booth each morning and will be available at a number of locations around the exhibition hall at The Venetian Macao. With attendance expected to surpass 12,000 visitors this year – and with copies personally handed out to delegates as they arrive – G2E Asia Daily will not only provide the most comprehensive up-to-date coverage of G2E Asia but will also present a unique opportunity for exhibitors to get directly into the hands of our visitors. IAG is Asia’s premier B2B gaming magazine. Founded in 2005, IAG is a monthly magazine with a broad business editorial focus on the Asian gaming industry. It is widely distributed to gaming industry executives throughout Asia. IAG is renowned for publishing “The Asian Gaming 50” each September. Anxiously awaited each year, The Asian Gaming 50 is an annual ranking of the 50 most influential and prominent Asian Gaming industry executives. IAG also publishes a special edition for G2E Asia in May. Many key exhibitors at G2E Asia advertise in IAG during this special edition, which is widely distributed at the show. Visit www.asgam.com for more. The American Gaming Association (AGA) is the premier national trade group representing the US$240 billion US casino industry, which supports 1.7 million jobs in 40 states. AGA members include commercial and tribal casino operators, suppliers and other entities affiliated with the gaming industry. It is the mission of the AGA to be the single most effective champion of the industry, relentlessly protecting against harmful and often misinformed public policies and paving a path for growth, innovation and reinvestment. Reed Exhibitions is the world’s leading event’s organiser, with over 500 events in 43 countries. In 2014 Reed brought together over seven million event participants from around the world generating billions of dollars in business. Today Reed events are held throughout the Americas, Europe, the Middle East, Asia Pacific and Africa and organized by 41 fully staffed offices. Reed Exhibitions serves 43 industry sectors with trade and consumer events. It is part of the RELX Group plc, a world-leading provider of information solutions for professional customers across industries.